THE ONLY VALUE OF A COW THAT DOES NOT WEAN A CALF IS KILL PRICE! Since the grain is more valuable than the crop residue it only makes sense to sell the corn and graze the stalks!! This requires our cattle to flourish on low nutrient feed. Recently, we added a small feedlot permitted for 999 head. The feedlot gives us many options for our calves. We also hope to be custom feeding in the near future. The cows calve on 1200 acres, near Tuttle, ND. Due to the fact we use a lot of calving ease genetics, the gestation on our herd is slightly shorter than some. By our official due date generally 35% of our calves are already born. By the end of the first cycle, we will be over 90% calved out. The bred heifers calve right alongside the cows. We don’t check at night and only a couple times a day. 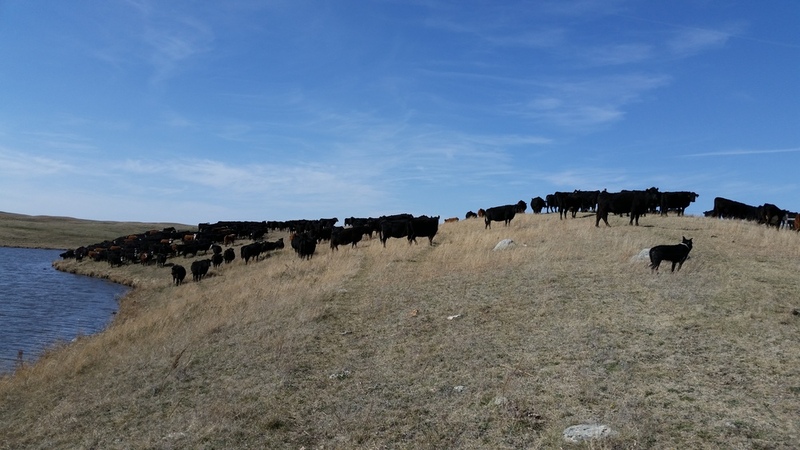 As the calves are born, the pairs are moved to a new pasture. Any straggling cows, the late ones bred after the first 42 days, are sorted and taken to a separate pasture, then culled. Breeding season begins in August. Currently we breed very few cows by artificial insemination. Due to the fact our cows calve in such a short time period, any cows that do not take by AI fall to second cycle. To eliminate this we AI about 2 weeks before turning bulls out. Any cows not bred by AI will still take first cycle. The herd bulls are turned out August 20th. Our replacement heifers are only exposed for 25-30 days, then the bulls are removed. We try to find the balance between roughing the heifers just enough and shortening the breeding season to eliminate about 30%. We consider this our bottom end. In the fall after the crops are harvested, the cows and calves are hauled back to Spiritwood for the winter. Calves are processed and put in the feedlot until marketing. The cows and bred heifers are moved to fields where they graze stalks. We graze our cow herd year around if weather permits. The cattle are only supplemented in the very cold winter months and on full feed when the snow is too deep to graze. Do to our very low elevation our winters are much, much, harsher than just 200 miles west. With the cows calving in June our cow’s nutritional requirements are at the lowest in January & February when the weather is the coldest. This helps reduce feed costs as much as possible. 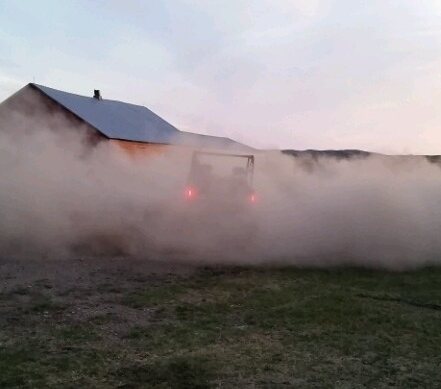 Since our cows winter on mostly crop residue our winter roughage costs are low. Living in the heart of farming country we have access to many byproducts. However, just because they’re easy to get doesn’t mean we feed them. Ultimately, we try to winter the cows as economically as possible. The main reason to winter supplement is the cold temperatures. Mid-December thru February is usually brutally cold. It’s not uncommon for us to have very few days where the temperature/wind-chill factor reaches above zero degrees. The cows will get by just fine in March and April when the weather isn’t brutally cold. They are busy grazing dormant grass. When you think about it, nutritionally, they aren’t getting shorted much. However, when we have 3 weeks of a -20 wind-chill factor and the cow’s nutritional requirements are up just trying to maintain body temperature, some supplement is required. The replacement heifers are weaned and put on a diet to maintain their condition over the winter. We target a 1.25lb/day gain from December to April when they go to grass. The girls look pretty rough going to grass, not weighing much more than at weaning and not cycling. All the heifers are measured for average daily gain (ADG) over the winter. In April, the heifers go to pasture where they graze dormant grass until May. By June 1st, the calves have gained a hundred pounds easy and they continue to gain rapidly all summer. This works as a flush effect for breeding. By August, the heifers weigh around 800lbs and look soggy, they’ve cycled a time or two and are ready to breed. We carefully develop our bull calves to achieve maximum performance without harming longevity. For the bulls to be appealing, we feel they need to have an adjusted yearling weight (YW) around 1000lbs. Therefore, we must feed a ration to target 2.25-2.5lbs/ADG. We feel this will not harm fertility or longevity. Around May 20th, after measuring yearling weights and scrotal size, the bulls are turned on grass pasture for the summer. They run in a large group with no supplement until October. We then put them on a high roughage ration until private treaty sales begin in January. The cattle are always measured for ADG, we feel if a ration is designed for a 2lb/day gain the cattle should meet or exceed it. The same goes for a 3lb/day 3.5lb/day or 1lb/day. Fertility is a trait we feel has been forgotten about by most seedstock producers and many commercial cattlemen. Research has shown fertility is FIVE time more profitable than growth or carcass merit! Unfortunately we hear very little about it. Next time you read a bull stud catalog take note of how many bulls are mentioned for growth and carcass, then look at how many are noted for fertility. Now we fully understand “fertility” is supposed to be a trait that IS NOT highly inheritable. We’ve seen many producers use this as an excuse to keep animals with low fertility. However, traits such as growth, early puberty, feed conversion and fleshing ability are medium to highly inheritable. All these are HUGE factors in what makes an animal fertile! If she’s a skinny heifer that doesn’t grow and doesn’t cycle she’s probably not going to get pregnant! On the other hand research is finding very heavily muscled heifers that express masculinity also have decreased fertility. Another thing we’ve been reading up on and find very concerning is that the cattle industry is breeding for less and less carcass fat. We’ve actually created an animal that requires more feed to get fat enough to cycle. We all know fat is required for a cow to cycle. The more we try and breed the fat away, the more feed and higher energy ration that cow needs to get enough fat to breed back. I’m not saying we want over-fat cattle but we need to remember fat isn’t the enemy. When it comes to fertility it’s our friend. 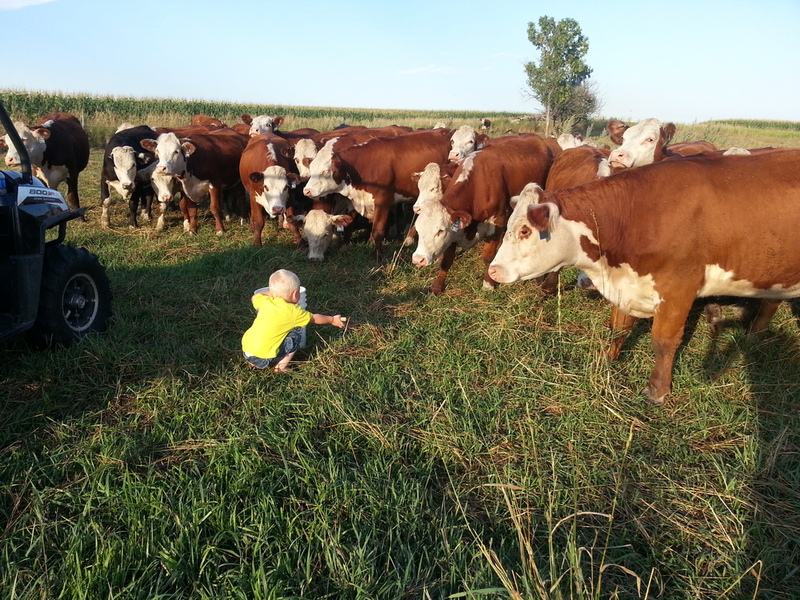 At one time we would spend a great deal of time trying to pick the best replacement heifers. We’ve come to the conclusion it’s impossible to walk into a pen of replacement heifers and pick the good ones. Nature sorts them. Chances are the ones that are left aren’t the ones you would have picked. Ultimately, it doesn’t matter what the pedigree is, what the numbers are, how pretty she looks, how she’s marked, or how big or how small she is. The important factor is how long she can remain in the herd. Our cows calve in large pastures unassisted. The first calf heifers are right beside them. We never set an alarm clock for night checks. Sometimes we only check cows and heifers once a day. Normally, checking for calves consists of counting new calves, tagging, weighing and vaccinating. We rarely assist a birth, and never help a slow calf (Those are snacks for the coyotes!). Calving season is a blast, driving around the pasture tagging calves. By the time the cows are all checked it’s time to start over again and again and again. Each time around we’re almost guaranteed to find a new calf or two or ten! When we get bored, we go do something else. Those calves will still be there when we come back. They’ll just be harder to catch! The main factor in all this is calving ease and calf vigor. It’s also a must for making good mothers out of first calf heifers. That calf needs to be born fast with minimal effort from the mother; it needs to come out standing and looking for milk! A heifer hardly ever leaves her calf if he’s determined to chase her down! Almost every bull we use is suitable for heifers within its breed. Very few of our sires have birth weights over 80lbs regardless of breed. 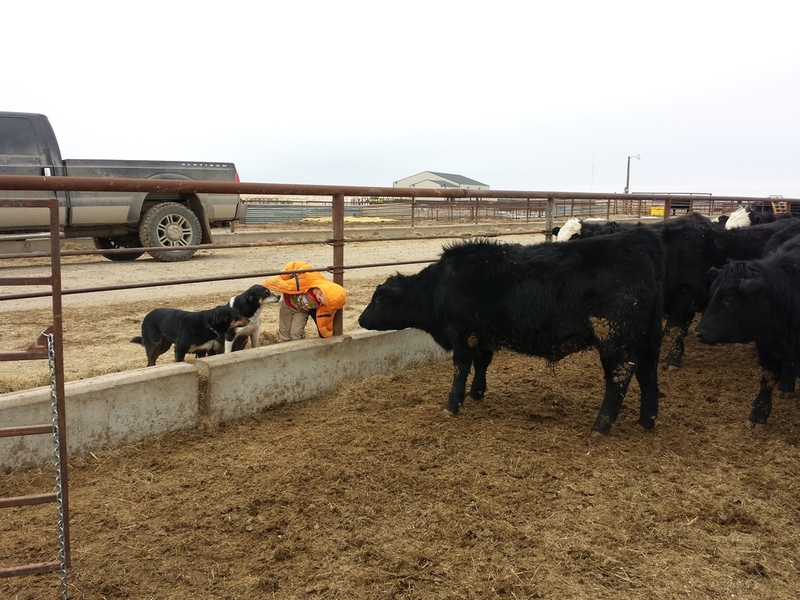 We like our first calf heifer’s calves to come small, shaped right, at 50 – 60lbs. There is no money in dead calves! Many may wonder how we can farm thousands of acres while calving hundreds of cows. It’s actually very simple, we do our work and the cows do theirs! Our calves are caught, (not always a simple task) weighed, tagged and not seen again until branding. With little to no death loss! Nope, don’t care for those cows! If a cow fails to mother her calf in our herd she’s eliminated. Heifers that don’t take care of their calves don’t get second chances. If we have to help a calf nurse, that cow is eliminated. We won’t let a calf die because of a bad mother; but if she needs help doing her job, she doesn’t get a second chance! Any cows that are missing calves at branding time are culled. Temperament is very, very important! Let me be clear, we’re not against a protective mother cow. Our cows are scored for temperament and mothering ability at calving. The cow that scores a 1 for being ease to work with generally doesn’t score a 1 for mothering ability. The two just don’t go hand in hand. We feel that a cow needs to be on guard 24/7 around her new calf. However, we still need to tag, weigh and vaccinate her baby. During calving we’ve found a happy medium, we watch her and she watches us, nobody gets wild and crazy and we all stay happy. We want bulls that don’t fight and are easy to deal with until their last day. The same is said for cows. Our cattle are loaded, hauled & unloaded from cattle pots 3 to 4 times per year. They are also gathered, sorted, synchronized, AI bred or rotated from pasture to pasture numerous times. They must be easy to deal with! We have little tolerance for wild cattle at our place. However, cattle with a minimal flight zone can be as hard to deal with. Bulls for example need to have a several foot flight zone; if he doesn’t you better watch your back! When you don’t expect it that bull will be in your flight zone! This appeals to cows also. Trying to move cattle without a flight zone is time consuming and frustrating. We would much rather handle cattle that don't want to be near us. However, we have no tolerance for the ones that take out a fence trying to get away! In our cow herd what we strive for is very simple. We want cows to produce to their maximum with the fewest inputs. Finding this happy balance is very complicated. We need super-efficient cows that out produce themselves. Inputs are based off “total pounds” the herd weaned and what it took to get those pounds. Were much more concerned about cow/calf weight percentage than individual weaning weights. For instance, we have 1400lb cows that wean 620lb calves which is 44% of her body weight. We also have 900lb cows that wean 550lb calves, or 61% of her body weight. In my mind that 900lb cow stomped that 1400lb cow in productivity! I could push my big cows that weigh 1400-1600lb to wean 50% of their body weight but the inputs would be horrendous! I would need to creep feed and probably supplement the mother cow, not to mention the extra body condition she would need over the winter to produce that much milk! For what it would cost to wean the extra 100-200lbs on 100 head, we could run more 900lb cows, wean 550lb calves, thus weaning more “total pounds” overall. When talking productivity the entire herd must work together with the environment. Very little is to be said for individual animal performance, especially in the commercial cattlemen’s world. We must remember for every increase in output there is an increase in input. Nothing is free! The trick is deciding if that input will be profitable. Commercial cattlemen get excited about a bull that weaned at 1000lbs, what they forget is what it cost to make that bull to wean at 1000lbs. What the heck is this?? HOPE GOD SEES AND SENDS RAIN!